Whether she wants to leave your chair with super sleek strands or the ultimate lived-in texture, one thing’s for sure—the products you use can make or break the outcome of your style. 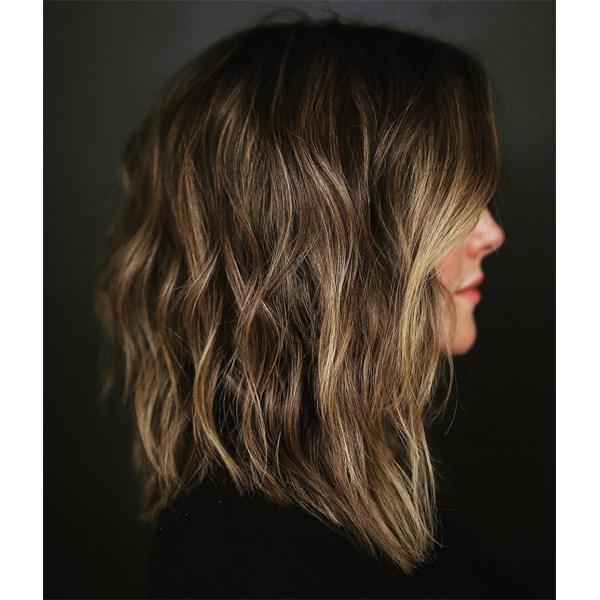 So below, not only are we sharing three on-trend lob styling how-tos from Buddy Porter (@buddywporter), but we’re also spilling his fave products for adding body, creating texture and keeping frizz at bay. Keep scrolling for all the deets! 1. Blow-dry the hair straight, then rough dry with cold air. 2. Curl the hair using a 1¼ curling iron and alternate directions by layer. Give the ends a slight bend for continuity but don’t curl them. 3. Shake out the hair while applying Virtue® Perfect Ending Split End Serum throughout. “It adds a slight amount of shine and gives the waves a little separation without being greasy,” shares Buddy. 4. Then, to give her strands added body and fullness, finish by spraying Virtue® Refresh Dry Shampoo at the root. 1. Wave the hair in alternating directions using a 1¼-inch curling iron. 2. Break up the waves by shaking out her strands while applying Virtue® Perfect Ending Split End Serum. 4. Finish by applying Virtue® Finale Shaping Spray for touchable hold and soft shine. 1. Prep wet hair with Virtue® One For All 6-In-1 Styler, then blow-dry her hair as straight as possible. 2. Apply Virtue® Perfect Ending Split End Serum, then part the hair down the middle and straighten her strands with a flat iron. 3. Then, apply a quarter-sized amount of Virtue® Polish Un-Frizz Cream from roots to ends and run a comb through the hair. Pro Tip: Use a sponge to apply Polish Un-Frizz Cream to tame flyaways without disrupting the hair too much. Click here to learn how to fix three of the most common beachy wave mistakes!